Ganesh and Teju are renowned world over for their folk music and art. 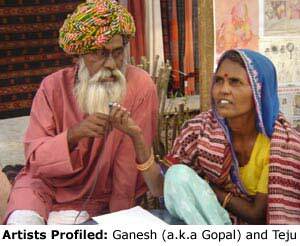 The couple are folk artists that belong to the Pauva caste, also known as Jogi or Bharathari1. Traditionally they moved from place to place-singing traditional folk and devotional songs at dawn. Today, this multi-talented couple is known internationally for their music and a form of art unique to them and their family- Jogi Art. 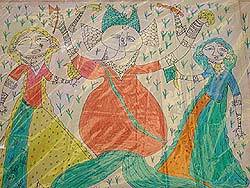 Haku Shah, a famous Indian artist and anthropologist, is responsible for the couple’s initiation into art. He frequently lived in the village where Ganesh and Teju lived, and after about five or six years of noticing him in their village, Ganesh arranged to meet him through a common friend – this was almost thirty years ago. Ganesh’s meeting with Haku Shah developed into a long association between the two. 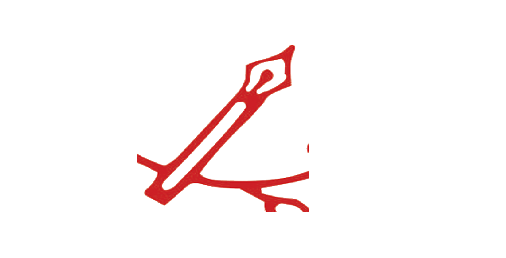 After singing a bhajan for Haku Shah, he was given a paper and pen and asked to draw. 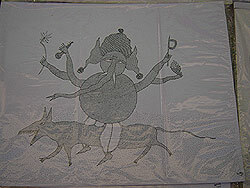 That was Ganesh’s first drawing ever, and is published in a book on him called Gopal. A few years later, encouraged by Haku Shah once again, Ganesh was encouraged to bring his wife Teju to draw with him, and together the couple under Haku Shah’s guidance gave birth to an art form unique to them. 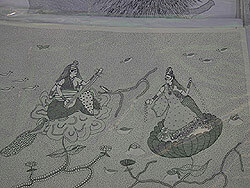 Jogi Art is a unique art form that is named after the Jogi community that its creators- Ganesh and Teju belong to. 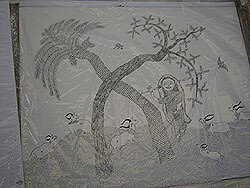 The paintings by Ganesh and Teju are made using basic tools, such as a ballpoint pen and paper. However, their paintings have evolved over time, and today they paint on paper, cloth using not just blue/black ink, but also color. They have also started painting using cotton or cloth on a stick. The paintings are a reflection of the artists’ lives, with motifs from their daily lives appearing in their paintings- scenes from their village, the sun, sky, the earth, pictures of goddesses. The artists take inspiration from the songs they sing, their traditional stories, Indian mythology and the things they see around them. 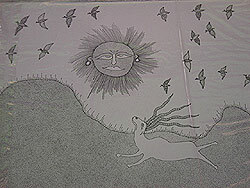 Usually, their paintings are composed on a single sheet of paper or cloth. Recently, while working on a painting based on the Ramayana, they decided to work on a single large sheet of canvas to accommodate all the images. The couple continues to experiment and improve their art. They recently tried working on canvas instead of paper, but found the medium unsuitable to their style, and financially unviable. Ganesh and Teju are vibrant, talented people and their paintings reflect this. With eight children, Teju reminisces about when her children were young and she would be happiest painting with her children around her or on her lap. The family works hard to develop their art and make a living off it at the same time. Even though their paintings are sold across the globe, making a living isn’t easy. The family lives off the income earned by the sale of their paintings, while they work on more paintings, sometimes, the children work as laborers to make ends meet. The whole family works in unison, handling the housework, the paintings as well as ensuring there is enough income to meet their basic needs. Ganesh and Teju have come a long way from traveling from place to place, singing songs to people at dawn, but they haven’t forgotten their music, it continues to be a part of their lives and their art.